Continuing this endeavour Paarangat since last year has been organising "Gulaab Bari -- A Tradition". This is a unique festival which celebrates the advent of spring the month of "Chait" through music and dance by performing on genres like the Thumri, Hori and especially the "Chaiti". This year Neelakshi Rai is showcasing this through Kathak along with Sunanda Sharma ji, adept in Purab Ang Gayaki, senior disciple of Padma Vibhushan Late Smt Girja Devi Ji. 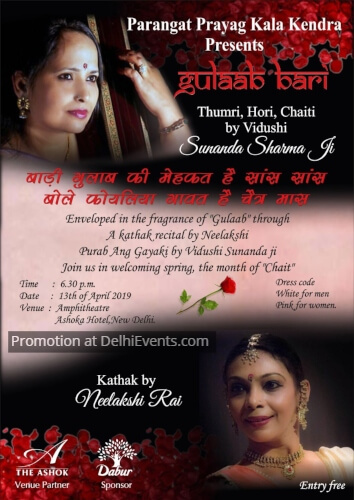 Enveloped in the fragrance of "Gulaab", through a kathak recital by Neelakshi and Purab Ang Gayaki by Vidushi Sunanda ji, join us in welcoming spring , the month of "Chait".